This month’s recipe post is brought to you by our Avon store manager, Steve Kent (affectionately called Steve Kent Goldings by us)! Many craft beer-lovers have contempt towards the beers of Mexico. This is no doubt because of that country’s role in the popularization and proliferation of watery, lime wedge-adorned, adjunct-laden pale lagers. But Mexico has a rich brewing history of its own, and in fact is singlehandedly responsible for saving a beer style from extinction: the Vienna lager. This style’s history is based on ingenuity, war, geopolitical intrigue, and cultural cross-pollination (and you thought Mexican beers were boring). Vienna lagers trace their roots back to 1841 and to one man. His name: Anton Dreher. His goal: to brew lagers in his native Austria that matched the flavor and quality of the pilsners brewed in Northern Germany. His only problem was that the water in Vienna was much harder than the water available in Northern Germany. His solution was to kiln his barley slightly longer than traditional Pilsen malt until it took on an amber hue. Naturally he called the resulting product Vienna malt, and thus the Vienna lager was born. Fast-forward several years and to an entirely new continent. After a bloody, years-long war against Napoleon III’s France, Mexico fell under European control. In 1864, Napoleon III gifted Mexico to Archduke Ferdinand Maximilian Josef Habsburg of Austria. Though he reigned for only three years, it was enough time for thousands of Austrians to immigrate to Mexico and bring their native country’s brewing culture with them. One of these men was Santiago Graf, who decided to take the standard Vienna lager recipe and amend it with inexpensive and readily available corn. By the 1890’s, his Negra Modelo was the most popular beer in Mexico. Thanks in part to Graf and his fellow Mexicans, the Vienna lager has had a resurgence in the craft beer community. 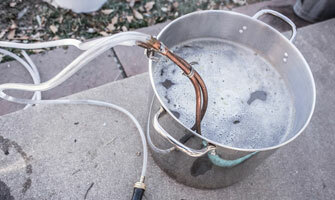 My version of the Vienna lager combines attributes from both the Mexican and Austrian styles. Like the originators of the style, I prefer a base of 100% Vienna malt. Vienna malt has a toasty, nutty flavor that just can’t be replicated anywhere else. I also prefer to use continental hops over their American cousins; in this case, the clean Magnum for bittering and the floral Saaz for flavor. Like our neighbors to the south, I like a little flaked corn in my Vienna lagers. If you prefer something more akin to a traditional Vienna lager, feel free to omit the flaked corn. A small amount of caramunich for sweetness and black patent malt for that signature dark amber color round out the grain bill. Unlike pretty much any other continental lager, Viennas beg for carbonate-rich water. Add about 1.5 teaspoons of calcium carbonate to your mash; otherwise keep your other minerals low. Homebrewers are able to use the Modelo house strain in the form of either White Labs 940 Mexican Lager or Imperial L09 Que Bueno. Both of those yeasts need to be special ordered, so plan ahead. If you’re impatient, Wyeast 2124 Bohemian Lager would work well in a pinch. Just like any lager, make sure you pitch plenty of yeast: either three packs (two in the case of the Imperial strain) or one pack in a 1 gallon starter will do the trick. If temperature control is going to be an issue, use the Bohemian Lager strain, as it will ferment safely up to about 65 degrees. Cheers! Or as our Mexican friends say, salud! 0.6 oz. Magnum hops (13.2% AA), added at the beginning of the 60 minute boil. 0.25 oz. Saaz hops, added with 15 minutes left in the boil. 3 packs (or make an appropriate starter) of Wyeast 2124 Bohemian Lager yeast or White Labs WLP940 Mexican Lager yeast (available by special order). Traditional Hochkurz Mash: The Hochkurz Mash, or literally “high-short” mash, is a mash that does a few steps to fully utilize all the different amylase enzymes that are active in the mash. For this beer, mash-in and perform a beta rest at 146F for 30 minutes, then raise the mash temp to an alpha rest at 158F for 30 minutes, followed by a mash-out at 168-170F for 15 minutes. Single-Infusion Mash: If you do not have the ability or do not feel confident doing a multistep mash, you can still make an excellent beer with a single infusion mash. Mash at 148-150F for 60 minutes. A mash-out at 168-170F for 15 minutes is recommended, but not necessary. Drain, sparge, and proceed with a 60 minute boil. Chill to 48-52F, pitch yeast, and allow to ferment at 48-52F for 2 to 3 weeks. A diacetyl rest at 8 to 10 degrees higher than fermentation temperature is recommended for 2-3 days near the end of fermentation. Check the gravity, and perform the diacetyl rest when gravity has dropped 2/3 to 3/4 of the way to the expected final gravity. Once final gravity is reached, lager the beer for 2 to 6 weeks at 38-44F before bottling or kegging. Note that the Bohemian Lager strain has a higher temperature range than the other strains (up to 65F), so use that strain if you do not have precise temperature control. Extract Version: Replace the Vienna malt with 6.6 lbs of Vienna liquid malt extract . Steep the specialty grains (flaked maize, Caramunich and Black Patent) at 150-155F for 30 minutes using a muslin grain bag. Remove the bag, allowing the grains to drain into the boil kettle. Turn off the flame and dissolve the extract in the kettle. Turn the flame back on, bring to a boil and proceed as above. NOTE: as the extract version is slightly different than the all-grain, you may have a slightly higher finishing gravity and slightly lower alcohol content.